“ He was alerted immediately and called on the case, another diamond stolen mysteriously. The moment he opened the dossier, a smile sparked in his deep eyes as he recognized her signature mark. He took one of his passports, burned the file and began the pursuit. 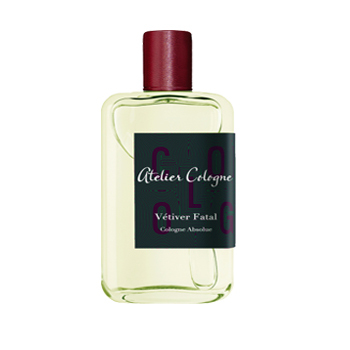 This time she wouldn’t get away…” Vetiver Fatal by Atelier Cologne is a Cologne Absolue. Cologne Absolue is pure perfume with a concentration of 15 percent essential oils ensuring exceptional long lasting power. For the first time, citruses are blended with the most precious natural raw materials for perfectly balanced creations. Each Cologne Absolue tells the story of treasured emotions and powerful memories. It has notes of Bergamot from Calabria, Sicilian Lemon, Bigaradier from Paraguay, Orange Blossom Absolue from Tunisia, Violet Leave from Grasse, Fig, Vetiver from Haiti, Cedarwood from Texas and Oud Wood from Malysia. Earthy and Masculine. Nice scent, very woody/herbal and masculine. A true unisex fragrance, no sweetness. If you’re into super feminine scents this will make you feel like you raided your husband’s cologne.